← MicroHooBook rumors are very probably false. A test of the non-Emergency Blogcasting System? 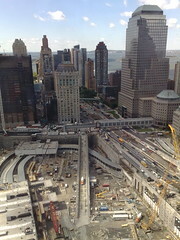 Robert Scoble has a very intriguing and tragic picture from Fast Company’s NY offices looking at Ground Zero. The attack on the World Trade Centers that killed almost 3000 innocent Americans will be viewed as one of history’s most significant events both as an unprecedented attack on America but also as the catalyst that set the stage for the most expensive security and military buildup in history. Did all this spending prevent more attacks? I think probably yes. Was the return on this spending as great as alternatives such as improved infrastructure? Almost certainly not.